not a very big waterpark but enough to spend hallf a day in it. Very very clean. Shower gel n shampoo are provided, so are hairdryers. Food inside are delicious and fairly priced. will definitely come back again! Itching for a family getaway? 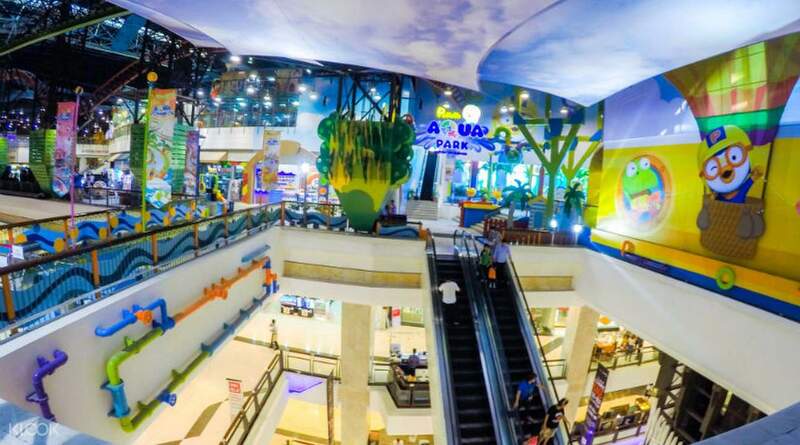 Pack your bags and get discounted tickets to the all-new Pororo AquaPark Bangkok! Located at the heart of Bangkok, transportation is accessible and will easily lead you to the sixth floor of the Central Plaza Bangna. Accredited by the International Association of Amusement Parks and Attractions, quality and safety is assured. 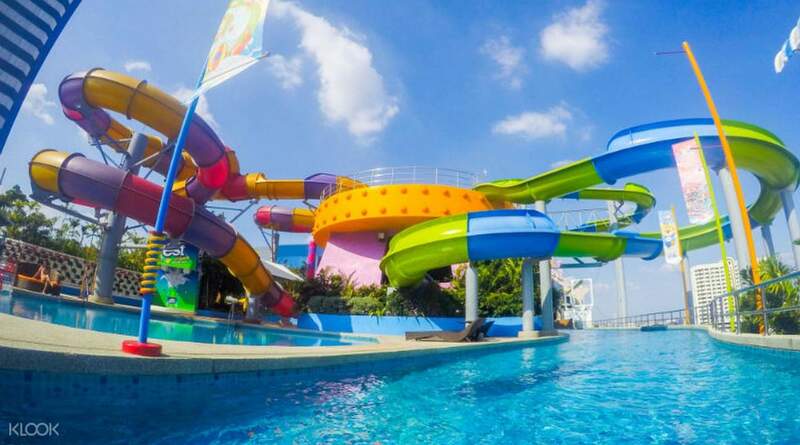 With over 10,000 square meters of water park fun, there's so much to explore for kids of all ages; the 600m Pororo's Funnel slider, Pororo's River ride that spans 400m, the heart-stopping Tong Tong's Magic Slide that lets the the family slide over the Bangkok skyline below, and many more exhilarating attractions. 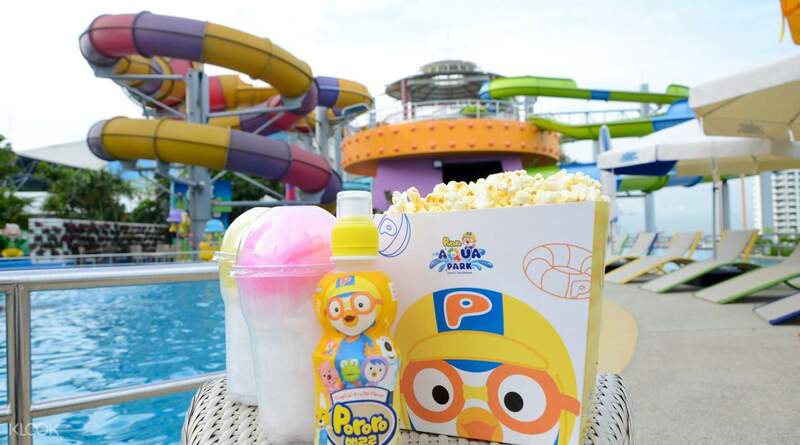 Kids can also swim to their hearts' content at Pororo's Playground Pool zones, nine child-friendly pools with interactive water play activities and slides. Relax at their resort-style lounges as international standard trained lifeguards keep an eye on your kids. Complete the stress-free outing with delicious food and drinks available at the park. After an exciting adventure around the resort, you can bring the kids to meet and play with Pororo the ‘Little Penguin’ and his cartoon friends. End the amazing day with an adorable dance show and entertainment provided by the iconic cartoon characters. 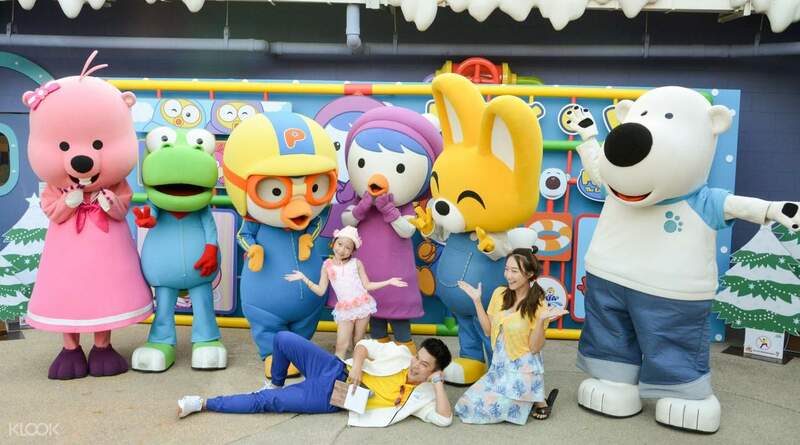 Don't miss Pororo's Funnel and Tong Tong's Magic Slide, two of the park's must-try slides! Hungry? Get your fill of the park's delicious food and drinks! Take fun family pictures with Pororo and friends! This is our third time in this water park. We love this very much and it is a good place for kids. It is clean and safe. There is improvement on food. We also walked around the shopping after palging in the water park. This is our third time in this water park. We love this very much and it is a good place for kids. It is clean and safe. There is improvement on food. We also walked around the shopping after palging in the water park. Nice place for kids. Fun. It's clean and well maintained. We went on Saturday but not over crowded. The rice set at terrace food stall is delicious, but their service speed is too slow due to inexperienced kitchen staffs. Overall, it's good. Nice place for kids. Fun. It's clean and well maintained. We went on Saturday but not over crowded. The rice set at terrace food stall is delicious, but their service speed is too slow due to inexperienced kitchen staffs. Overall, it's good. When My family went to the Pororo water park we had lots of fun and we had and easier way to get in because we had the voucher on my phone and didn’t have to buy it there. They also liked the laser game which was better. When My family went to the Pororo water park we had lots of fun and we had and easier way to get in because we had the voucher on my phone and didn’t have to buy it there. They also liked the laser game which was better. yayyy, its a cool place to enjoy the water splash! kiddies sure will very happy to be there, thank you klook to make our journey awesome! yayyy, its a cool place to enjoy the water splash! kiddies sure will very happy to be there, thank you klook to make our journey awesome! 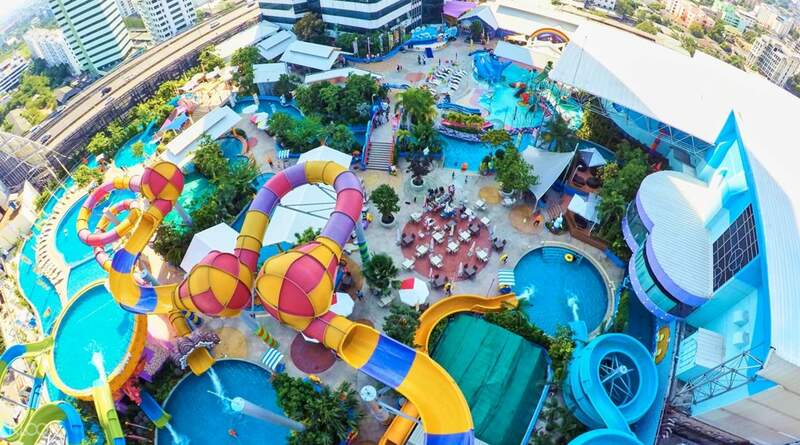 it is a decent water park situated at the central plaza rooftop. water is clean and has enough rides to engage the kids. it is a decent water park situated at the central plaza rooftop. water is clean and has enough rides to engage the kids. We saved a lot of money! Food inside the park was so cheap. There's a lot of lifeguard looking around each pools. We will definitely come back! We saved a lot of money! Food inside the park was so cheap. There's a lot of lifeguard looking around each pools. We will definitely come back! Great location because it is inside the mall. The changing and shower room is clean but they only have hot shower. We can’t control the temperature. There’s only a few slides and food selections. Nevertheless, we still enjoyed. Half day is enough for this waterpark. Great location because it is inside the mall. The changing and shower room is clean but they only have hot shower. We can’t control the temperature. There’s only a few slides and food selections. Nevertheless, we still enjoyed. Half day is enough for this waterpark. The place is good for kids to play. Have 4 different long slides which are really fun. But not much food for sell inside, need to bring some snack along. There are also mini show with character performing and photo taking. The water have clean and the staff is friendly. The place is good for kids to play. Have 4 different long slides which are really fun. But not much food for sell inside, need to bring some snack along. There are also mini show with character performing and photo taking. The water have clean and the staff is friendly. Fun place for the kids! Take note a lot of additional expenses for the rentals at Thb60 each (Lockers male and female each, towels, tubes, and kids life vests again Thb60 EACH!). Bring your own towels and kids tube instead of life vest. You can just rent one locker and share it for the whole family or bring minimal things and don't rent a locker at all. You can move your things as you go to different sections of the park. Shampoo and shower gel provided in the shower rooms. Enjoy! Fun place for the kids! Take note a lot of additional expenses for the rentals at Thb60 each (Lockers male and female each, towels, tubes, and kids life vests again Thb60 EACH!). Bring your own towels and kids tube instead of life vest. You can just rent one locker and share it for the whole family or bring minimal things and don't rent a locker at all. You can move your things as you go to different sections of the park. Shampoo and shower gel provided in the shower rooms. Enjoy! It's not a big park but there's plenty to do over the course of a half day or day. There are only three large slides, I think it is, versus lots in those other parks, and only two that are mid-sized.For people visiting Bangkok I think one advantage I wasn't considering might be that it's warm here and that works against you for walking from sight to sight, or for daily commuting, but it's perfect for a water park. It's not a big park but there's plenty to do over the course of a half day or day. There are only three large slides, I think it is, versus lots in those other parks, and only two that are mid-sized.For people visiting Bangkok I think one advantage I wasn't considering might be that it's warm here and that works against you for walking from sight to sight, or for daily commuting, but it's perfect for a water park.